Option #2 would be to rebuild my old Zapap Lauter Tun. Since it only had the capacity to do about 12 lbs of grain (being made from 5 gallon buckets, that was out of the question. Option #3 would be to build a bigger mash tun. I think it was about time to do so. Lifting the grain bag from bucket to bucket repeatedly to sparge the grains was beginning to get tiresome. Having a proper mash vessel would greatly improve both labor and mash efficiency. Maybe I build something like this? So I set out looking for a suitable cooler to convert into my mash tun. Craigslist had a few here and there, but nothing suitable or cheap enough. My local thrift shop had a cooler that fit the bill, but they refused to sell it to me since the price tag was ripped off. It was then that one of my housemates tipped me off to a cooler in our own backyard; abandoned from a rafting trip years ago. I can't believe that this was right under my nose. Low and behold the cooler existed! However, the thing was still a mess from when it went rafting. I had to clean out the interior of the garbage and gunk from the swamp it likely fell in (there were some empty beer bottles inside though!) After getting it cleaned up, it was time to make some plans to convert it into a suitable mash tun. I took a peek inside to see what I had to work with. The outlet was mounted at an angle at a slightly higher height than the bottom of the cooler. So in the design, I would need to build a manifold that would act as a siphon to grab any water that dropped below the outlet spout. I found some plans and ideas from a thread and a video online, and set my build in motion. My first step was to remove the current cooler bulkhead. Using a pliers, this was easily removed. I kept around the gasket and o-ring from the interior of the cooler, as these will be used in the installation of the new bulkhead. A wrench would work here too. Here is where your wort will be dispensed. Since I already had a cooler, my total cost for all the other parts (without tax and not including the PVC cutter) was $16.90. The new bulkhead, requires the CPVC male adapter, original cooler gasket and o-ring, new o-ring, ball valve, and barb (in that order). The interior of the mash tun will have the cooler oring, gasket, and male CPVC adapter, while the exterior has the rubber o-ring, valve and barb. Valve positioning is upside down but still is functional. 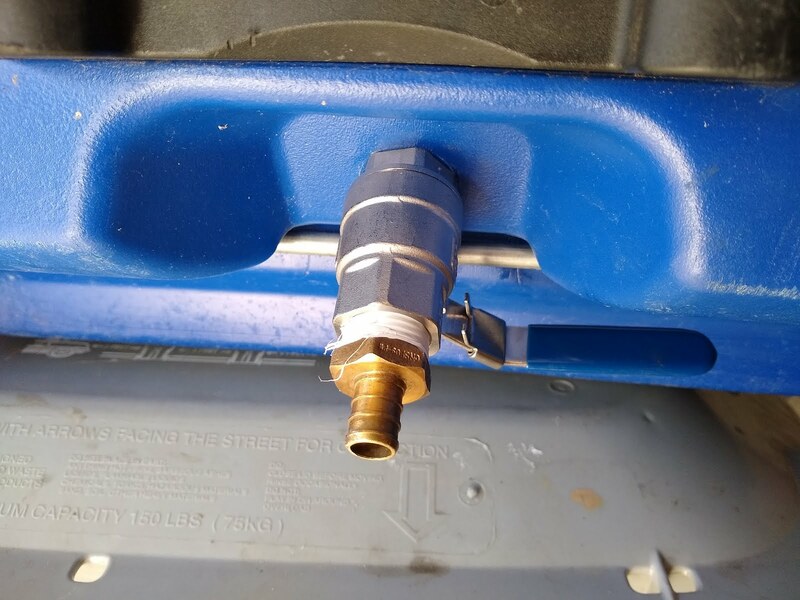 Due to the way the exterior of my cooler was built, I had to position the valve "upside down" to be able to completely open and close it. Your mileage may vary depending on your model of cooler. The cuts of CPVC and fittings required. After cutting all the CPVC, I assembled it in the form the manifold was supposed to take. In order to fit the entire thing inside the cooler, the fittings need to be pushed onto the pipes as tight as possible to skid along the bottom. It took a little wiggling to get the manifold in place. But once it was fitted across the bottom of the lowest part of the cooler, it was a snug fit. After installing the manifold, it was time to do a test to ensure that there were no leaks and that the siphon system worked properly. Low and behold, my bulkhead started dripping water when it was added. Additionally, water was not being drained from my valve. This meant that the slits from the PVC cutter weren't large enough. I remedied this issue by using a hacksaw to make the slits larger. Ready to test the new slits. I tightened up the bulkhead while the manifold was outside of the cooler. That fixed the leak I had from the cooler. With one problem down, it was time to test the new slits. Success! I got water to drain the cooler nearly completely empty with the new slits and tightened bulkhead. Only thing left to do now was to test it for my next batch of beer. Less than 1 cup of water left. Before I started though,brewing though, I cut a small length of some 3/8" ID tubing and hooked up to the barb. I was only able to do this though after heating it enough so it could slip on without any issue. Testing it with the new brew!